Not seeing the results you are seeking from your current exercise program? Before I became a personal trainer, I thought I had all of the answers to keep myself in tip-top shape. I always had trouble keeping muscle tone and didn’t feel like my performance was improving with as much time as I spent in the gym. I dedicated my life to learning the ins and outs of fitness. First by getting certified by the top fitness accreditation program in the industry and then spending years in a top gym facility with hundreds of clients. What I found out was that the majority of people never develop a proper foundation for their fitness program. That’s why they weren’t getting previous results! So I developed a tried-and-true system that is customized to each individual’s specific needs and level of fitness. Like a tree, you can’t have the fruits without the roots! In my time as a personal trainer at the 2nd busiest gym in the United States, I was able to consistently produce dramatic results for clients that were previously unable to break themselves from their own personal fitness plateaus. Now I have combined these foundational skills into an 8 week (2, 4 week parts) program that I will be leading in Uvita. You could actually lose those 15 lbs that you’ve been struggling to shed. You could wake up in the morning and have sustained energy the entire day. Your recreational activities like surfing, hiking and tennis were suddenly much easier to do. You no longer experienced pain as a result of your exercise. You finally had the muscle definition you’ve been longing for. What will you learn in my Movement + Circuit Class? 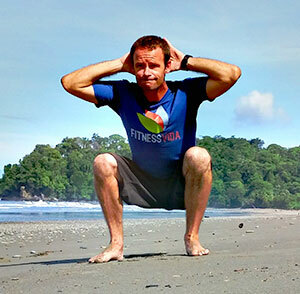 Proper core and glute engagement – The foundation of all exercise movements. The 7 key human movement patterns – Fundamental to pain-free movement. Kinetic chain alignment and applying it to exercise motions. How to properly warm up and cool down before and after exercise or any physical activity. Proper use of functional fitness tools such a TRX, Resistance Bands, Kettle Bells, Balls, Sliders and more! Eric Manthey is deeply passionate about providing his clients with science-backed fitness information, not just hype or trends. His goal is to make fitness accessible to everyone, no matter their background or history with physical fitness. He truly cares about his clients and serves each one with a highly individualized training program that begins with an in-depth evaluation and takes all health matters, such as age, injury, and current fitness level into consideration. Eric is a certified personal trainer with specializations in corrective exercise, sport performance and functional fitness. He spent several years working in the second highest-producing gym in the United States, where he worked with hundreds of clients on achieving their personal fitness goals. I am just getting back into fitness. Will this be too hard for me to keep up? In most cases, no. This is an entry level class, but due to the programming, will challenge even the most fit people. If it is too hard for you, Eric will work with you to regress any exercise to your level. Classes are currently being offered on Tuesday mornings at 8:30 am. Will I be guaranteed a spot each week? Yes, Space is limited to 6 participants only, per class and this is a private, closed group so drop in’s will not be permitted. I purchased a 4 class card but have to miss a class. Can I make up the class? Since this is a 4 week, private class, makeup’s will not be held. For all other situations, please speak to Eric directly. He’s a nice guy! I’ve missed the first few classes, can I still jump in? We would recommend that you wait until the next 4 week session begins. Bring a water bottle, towel and yoga mat and open mind. Call or text Eric at 8338-7760, or email him here. Space is Limited to 6 Participants – Sign Up Now Below!